Last weekend was filled with a lot of family obligations and chores so this weekend I’m hoping to spend time doing more fun stuff. First on my list is to get started on some new books. I wish I could tell you which one right now but I swear I’ve spent the last 30 minutes just staring at my bookshelves. I pick up a shelf-sitter, a review copy, a library book, etc… I can’t seem to decide on what to read next. Don’t you hate it when that happens? Spend some quality time at Half Price Books. I’ve got a coupon. Make more smoothies. My husband and I have been trying a new recipe from this book almost every night. Maybe stopping at the Farmer’s Market to buy more smoothie ingredients. PVA will be my best friend. 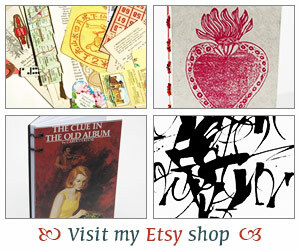 I plan to do some bookbinding this weekend. Alright, I’m off to find a book to read. Hope everyone has a fantastic weekend! I love smoothies; and that book looks interesting! I hope you’ve a great weekend, Iliana. Hope you settle on a good book and have a great weekend. Dude. I feel your pain. Not because nothing looks good, but because I want to read EVERYTHING next. I have been picking up and reading bits and pieces of multiple books over the past couple weeks, but haven’t managed to finish any of them. And I still keep bringing more books home from the library! I hope you have a happy 4th and get to spend the weekend doing at least some of the things you’ve got in mind. Sometimes it’s hard to tell what your mood is for a book. I’ve started some, stopped after a couple of minutes of not connecting with the book, and went to the bookshelf to find the right fit. It’s funny how your mood affects so much what you want to read. Jordan – Isn’t that true!! I think we just get overwhelmed by all those stacks of books – ha,ha..
Nymeth – guess what? four books grabbed my attention so luckily I was able to snap out of that quickly! Have a super weekend!! Nicole – I totally agree. I think that’s also one of the reasons I have a hard time finishing challenges… My mood certainly dictates what I read next! Haha! I’m having the same problem with choosing a book right now! My solution is to alternate books–reading a chapter out of each one. Crazy? Yes. But it works. 🙂 Enjoy your weekend! Tiffany – My problem got solved! I’ve got four books going on 🙂 Hope you are enjoying your books! I just finished something GREAT so it’s going to be difficult to choose something else to start today. Chances are, it won’t live up. I am thinking about giving up on my current read and starting something else – we’ll see. Hope you had a fun weekend of all the things you mentioned – the smoothies sound yummy! Tara – Ooh, can’t wait to find out what you read… I’ll be over to check it out. It’s so hard to come off from a reading high isn’t it. The next books are sure to suffer but hopefully you’ll luck out and grab another good one!